While we’re on the subject of President Barack Obama’s alleged concern for the middle class of Americans (OK, only Obama makes the allegation with any seriousness, but work with me here), Investor’s Business Daily has another take on the Obama Recovery. The Obama recovery is worse than four years behind Obama’s promised schedule. It hasn’t caught up. 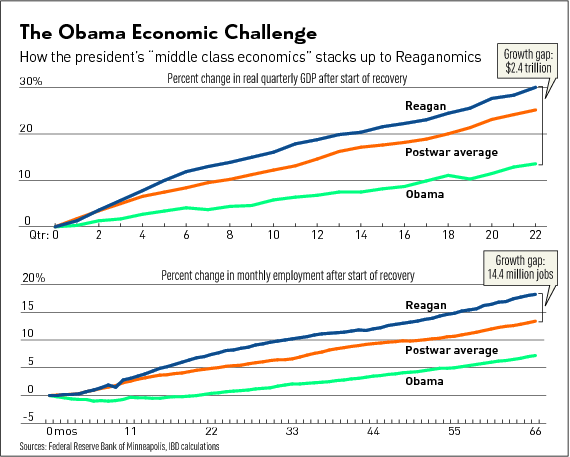 It hasn’t caught up with the Reagan Recovery, with his “failed” Reaganomics. It hasn’t even caught up with the average of the recession recoveries we’ve been through since WWII, a period of some 70 years, 3+ generations of Americans. [T]he growth gap between Obama’s economic policies and Reagan’s is now $2.4 trillion in lost GDP and a stunning 14.4 million in lost jobs [the bracket in the lower figure of the graph is a typo]. [W]e [need] someone in the White House who understands what it takes to produce real, sustained economic growth, and not just “underlying” suggestions of it. This entry was posted in Economics, jobs, political economy, politics and tagged economics, jobs, political economy, political parties, politics by eehines. Bookmark the permalink.